A judge has ordered two parents accused of shackling, starving and beating some of their 13 children to face trial on torture and child abuse charges after two days of horrific testimony at a pre-trial hearing. 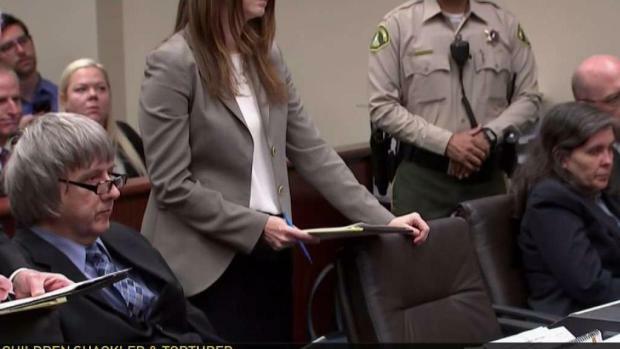 David and Louise Turpin were in court for the hearing's second day Thursday in a Southern California case that attracted worldwide attention following their arrests last winter. Riverside County Superior Court Judge Bernard Schwartz found probable cause that they abused 12 of their 13 children for years. The judge threw out a domestic violence charge involving the youngest daughter. At the same time, seven of their adult children were in a separate courtroom at a guardianship hearing. Jack Osborn, a lawyer for the 13 children, said no decision was reached on appointing the Riverside County Public Guardian as their long-term conservator. Bailiffs cleared the hallway after the appearance to clear a passage for the adult children who were ushered out of view. The abuse came to light in January after their 17-year-old daughter escaped from the Perris house -- a plan she said was two years in the making -- and called 911. The girl's conversation with a police dispatcher, in which she details squalid conditions in the home, was played Wednesday in court. The girl is heard on the recording saying two younger sisters and a brother were chained to their beds, choked, starved and beaten. She told the dispatcher that she could not take it any longer and pleaded for help. 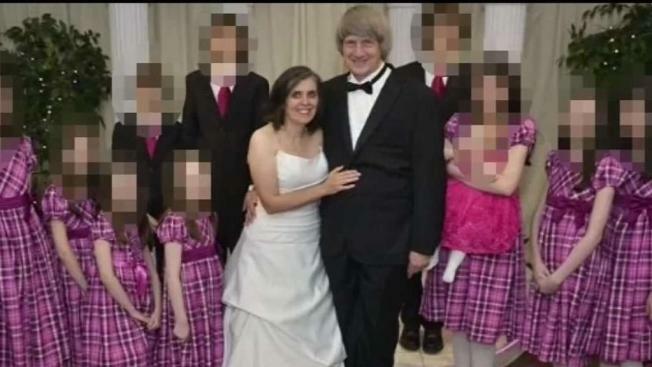 The Turpins have pleaded not guilty to torture, child abuse and other charges. They are being held on $12 million bail each. Louise Turpin dabbed her eyes with a tissue as the recording of her daughter was played. The 911 call marked a new start for the 13 Turpin offspring -- ages 2 to 29 -- who lived in such isolation that some didn't even understand the role of the police when they arrived at the house in Perris, 70 miles southeast of Los Angeles. Two girls, 11 and 14, had been hastily released from their chains when police showed up, but a 22-year-old son remained shackled. Doctors who examined the children found signs of severe malnutrition and muscle wasting. Some couldn't speak well and a 12-year-old girl didn't know the full alphabet. Children were deprived of food and things other kids take for granted, such as toys and games, authorities said. They were allowed to do little except write in journals that may corroborate the horrific stories they told investigators. Some suffered from severe malnutrition and muscle wasting, said investigator Patrick Morris. An 11-year-old girl who was shackled to a bed had arms the size of an infant, he said. "Sometimes I wake up and I can't breathe because of how dirty the house is," the girl told the dispatcher. She reported that her father pulled down her pants and put her on his clothed lap in a recliner chair in the TV room when she was 12. She said she didn't like it and pulled up her pants, and that he told her not tell anyone, Campos said. The eldest son in the family told authorities discipline in the home included beatings with the leather or buckle end of a belt, said Wade Walsvick, senior investigator for the Riverside County district attorney's office. Years earlier, when the family lived in Texas, he said the beatings involved "a switch, the paddle and the oar" and the siblings were sometimes placed in cages.